Cutters / Beveling Equipments .. Constructed of durable and lightweight hard-anodized aluminum. Quick operating boomer assembly securely locks the machine to the pipe for an entire 360º rotation; No repositioning necessary. Patented H&M™ Cuboids Spacer System keeps the spacers on the machine to minimize set up time and post spacers. 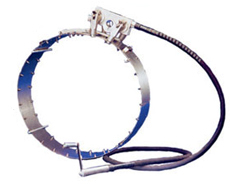 Crawler works with all sizes of beveling bands for 6" pipe and above. Mounts easily anywhere on the pipe. 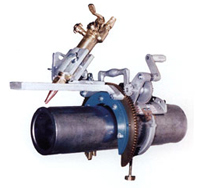 Crawlers have flexible 9' drive shaft standard; flexible 14' drive shaft for larger diameter pipe. No need for out-of-round pipe attachments.